This page is being re-written and restructured. On L-W-O we encourage our members to become their own advocates or "expert patient" although the latter will require a degree of diplomacy. The more you learn on how to self-manage your condition the easier it will become to live with lymphoedema. Self-management however, can be daunting and I prefer to think of it as self-care. 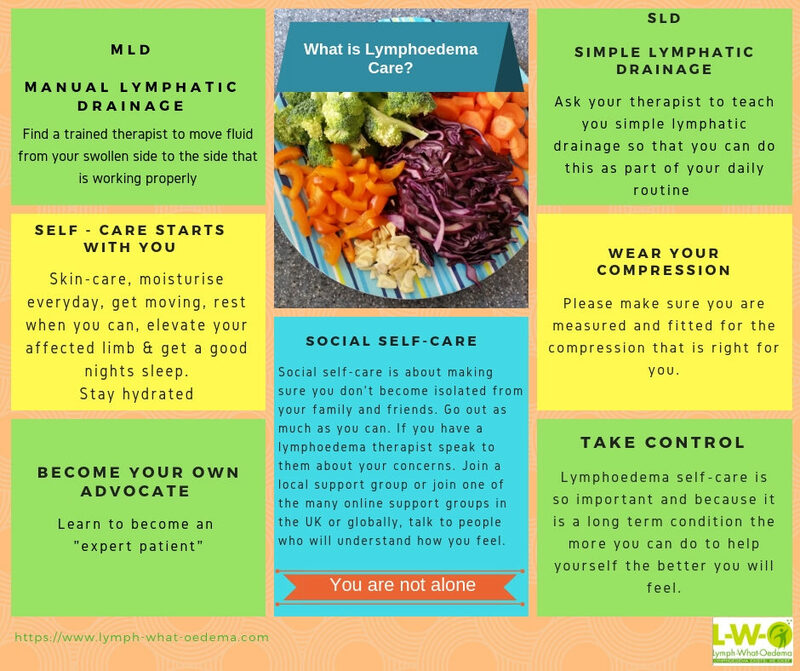 It starts with you learning to understand your condition and, on this page, I will explain in simple terms as much as I can about the lymphatic system, but I ask the reader to bear in mind I am not a medical person but someone who lives with secondary lymphoedema. Learning how to manage lymphoedema or taking care of yourself is a major part of treatment. At first it may seem overwhelming and feel unfair they you have all this to deal with. It is normal to have these difficult feelings from time to time. Your lymphoedema specialist will explain, and show you, what you can do to help yourself. Gradually you'll find that you can develop a routine that builds lymphoedema self-care into your everyday activities. Family and friends often want to help and there are many practical things they can do, such as heavy lifting or carrying, helping you with your compression garment, or massage. 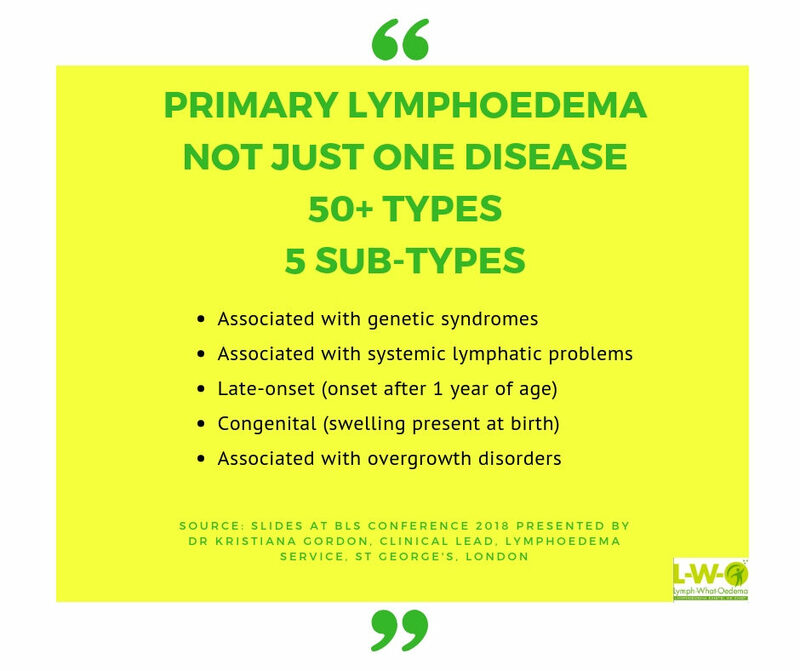 Primary lymphoedema - that developed at birth or shortly after puberty and is caused by faulty genes or missing genes. Secondary lymphoedema - caused by damage to the lymphatic system as a result of an infection, injury, trauma or cancer. Lymph fluids flows through the lymph nodes, which act as a filter destroying or trapping anything harmful that the body doesn't need. This includes bacteria, viruses, damaged cells or cancer cells. Unlike blood, which flows throughout the body in a continual loop, lymph flows in only one direction - upward towards the neck - within its own system. It flows in to the venous blood stream through the subclavian veins, which are located on either sides of the neck near the collarbones. Lymph nodes contain white blood cells (lymphocytes), which attack and break down bacteria or other harmful cells. Waste products and the destroyed bacteria are then carried in the lymph fluid into the bloodstream and are disposed of with other body waste. Sometimes, the lymph nodes trap bacteria or viruses that they can't destroy immediately. The lymph nodes then swell and become tender and sore to touch. This is usually the sign of infection that may need treatment with antibiotics. Sometimes, cancer cells spread into the lymph nodes from a cancer in another part of the body. It is also possible for a cancer to start in the lymph nodes themselves (lymphomas). If this happens, the lymph nodes become swollen but are usually painless. This video is one of the best I have seen for showing how the lymph system works. This is the liquid that flows through the lymph vessels and the lymph nodes. It forms when excess liquid, from the fluid that surrounds all our body tissues, drains into small lymph vessels. Lymph nodes are found throughout the body, but mainly in the neck, armpits, groin and tummy (abdomen). Made of Lymphocytes, connected to a system of vessels. These vessels are like veins except that instead of blood they carry lymph fluid. Lymph fluid contains waste products and immune cells. They are made of tissue and contain special cells that help fight infection and disease such as cancer. 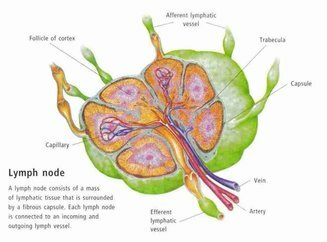 Lymph nodes get bigger when they fight infection. Lymph nodes vary in size; some are as small as a pinhead and others are about the size of a baked bean. The number of lymph nodes in the body varies from person to person. There are 600 to 700 lymph nodes in the human body that filter the lymph before it returns to the circulatory system. Different parts of the body have different numbers of nodes; for example, there are about 15-30 small nodes in the armpit. There are different causes of swollen lymph nodes, but if you develop a painless, swollen lymph node it is important to have it checked by your GP. The above photograph is of L-W-O member Jane Hoy. 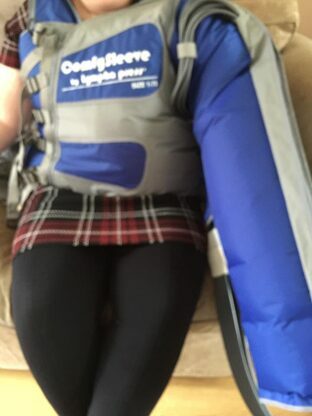 This sleeve is effective therapy for arm, breast and torso lymphoedema and can be used in clinic or at home. The sleeve can only be prescribed by a medical professional or therapist. Another subject that has also came up in members group is 'cording'. Always contact your own health care professional. On our Members Facebook page we were asked by one of our members whether any of us had heard of a leaking wound. Needless to say, we hadn't, however, Karen Friett, CEO of LSN suggested it might be Lymphorrhoea. I am not comfortable with and do not have the knowledge to cover Lymphorrhoea. 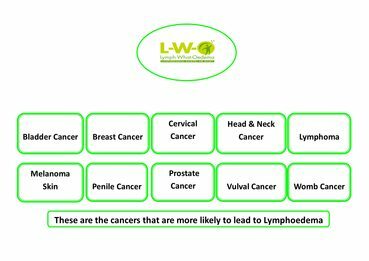 So, I did some research and through LSN I have obtained a leaflet outlining, what Lymphorrhoea is, common causes, prevention and what to do if it occurs. The article is a lengthy one and at this time, my web page, does not have the space to put it all on. Lymphline, Summer 2014 also carries the same article. Lymphorrhoea described as a 'leaking of fluid from the surface of the skin'. The fluid is straw coloured. This can be caused by a scratch or minor knock to the skin. It is most likely associated with cancer related lymphoedema, but can happen to people with other forms of lymphoedema. The most common place it is likely to appear is the legs. 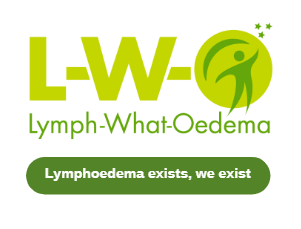 www.lymphoedema.org (LSN) article written by Melanie McCann, Lymphoedema Nurse Specialist. Was first published Winter 2009 issue of LymphLine and reviewed and republished 2014. You can also contact LSN by telephone; 020 7351 4480 for information and support. 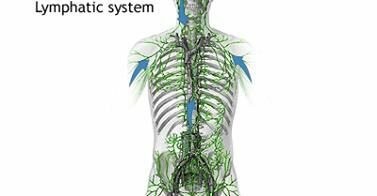 Briefly the lymphatic system is made up of groups of lymph nodes throughout the body which are connected by a network of lymph vessels. Lymph vessels are a network of tubes that go all over the body. Some are tiny channels just under the skin, which can be easily damaged if the skin is broken. Small lymph vessels join together to form larger lymph vessels, which pass through lymph nodes. The fluid then travels through larger lymph tubes and drains into the bloodstream. If, for whatever reason the lymphatic system is not working correctly, or the vessels are not draining adequately, the fluid in the tissues builds up (as when a river is dammed and flooding occurs). Swelling occurs when the amount of fluid in an area, is greater than the capacity of the lymphatic system to transport it away. Lymphoedema can, therefore, be defined as 'an abnormal accumulation of protein rich fluid in the tissues'. Treatment for lymphoedema aims to reduce swelling, relieve discomfort and prevent more build-up of fluid. Following treatment, the limb or area should become less swollen, easier to move and feel more comfortable. Sometimes it may take several weeks or months before you notice any real improvement. Skin-care to keep the skin and tissues in good condition and to prevent/reduce the risk of infection. 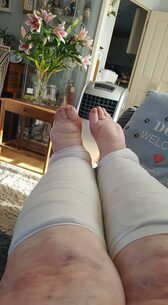 External Support/Compression in the form of compression garments to help prevent the swelling from building up in the limb. Manual Lymphatic Drainage (MLD) - specialised form of massage carried out by a trained therapist to move the skin in specific directions based on the underlying anatomy and physiology of the lymphatic system. Simple Lymphatic Drainage (SLD) - a gentle massage technique that is based on the principles of Manual Lymphatic Drainage (MLD). It involves the use of simple hand movements to try and move the swelling out of the affected area. Ask you MLD therapist to show you how to do this. 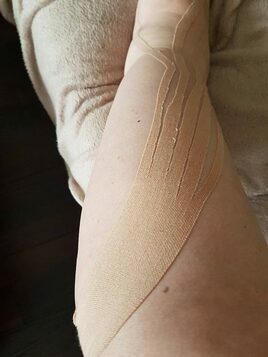 Multi-Layer Lymphoedema Bandaging (MLLB) is a multi-layer system of bandages provides a rigid casing for the muscles to work this helps to improve the shape of the arm and reduce severe swelling. Intermittent Sequential Pneumatic Compression Therapy. A unique patented inflation and deflation sequence, designed according to the principles of MLD, which aims to clear the proximal lymphatics to assist lymph flow of the affected limb. Kinesio tape may be used as an adjunct to treatment. This is a special sports injury tape which is used over an area of oedema to enhance fluid drainage. If this is part of your care plan you will be shown how to apply the tape at home. Photograph of L-W-O's member Jam Bradley's leg using Kinesio tape. A programme of exercise and movement to try and maximise lymph drainage without over exertion. For people with a more severe swelling, additional treatments may be recommended within a more intensive treatment programme called Decongestive Lymphatic Therapy (DLT). This intensive treatment may last for a period of 2 - 4 weeks and combines a package of treatments. These may include some of the above, plus one or more of the following. Some of our members use Farrow Wraps for compression as the above photograph shows the wraps. Below photograph shows our member now able to get her normal compression garments on. 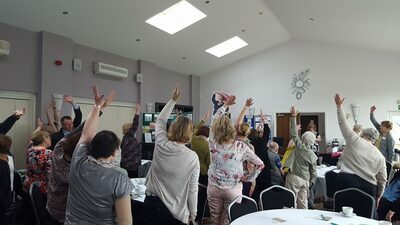 In members group one of our greatest achievements was through our member Rosie who found out and shared that patients with secondary lymphoedema were entitled to free prescriptions. The relevant wording comes at the end of the document which I put here in brief. "The effects of cancer treatment" may be in respect of current treatment or previous treatment and could arise sometime after the treatment. They include all the side-effects of cytotoxic drugs listed in chapter 8 of BNF and includes prevention of side-effects of these drugs. This is an example, not exhaustive, and effects of treatment also include effects of radiation, including the need for camouflages, and secondary lymphoedema. Source: Department of Health, January 2009. In simple terms the lymphatic's form part of your immune system, helping to deal with infection at a local level but just as importantly they are responsible for cleansing your tissues and maintaining a balance of fluids in your body. It can be likened to a waste disposal system, taking tissue fluid, bacteria, proteins and waste products away from the tissues around skin, fat, muscle and bone. Once inside the lymphatic vessels (which are barely visible just under the surface of the skin) the tissue fluid becomes known as 'lymph' and it is then transported in one direction by increasingly larger and deeper lymphatic vessels. Movement of lymph depends on muscle movement (exercise) and the contraction of the vessels themselves. Gentle massage known as Manual Lymphatic Drainage (MLD) and deep breathing can also help to move the lymph more effectively. The above photograph was taken at the Lymphoedema Awareness Day, May 2016. L-W-O members doing Healthy Steps. Exercise is important to the movement of lymph fluid. At some point in its journey, lymph will pass through a lymph node. Clusters of these nodes are found in the neck, armpits and groins. It is here that the lymph is filtered and cleansed, so that the waste matter and harmful cells can be identified and removed by the body's defence system. Having passed through these nodes, lymph finally drains back into the large veins of the body at a point just behind the collarbone, on each side of the neck. From here it goes back to the heart and is eventually removed from the body as urine through the kidneys. Please make sure you read the footnote at the bottom of the page.